Are you overloaded with your children's outgrown items, but short on time to prep them for the sale? Our Valet Tagging Program is for YOU!! Simply gather your clean, organized items, and drop them off with your designated Valet Tagger. We will prep, price, tag and store your items until the next season's sale. As a Valet Consginor, you will earn 45% of your sales, and receive your check two weeks after our event. It's So SO easy! Slots for our Valet Progam fill up FAST! Be sure to sign up AND drop off your items by August 31st to guarantee your items make it into our Fall 2018 Event! 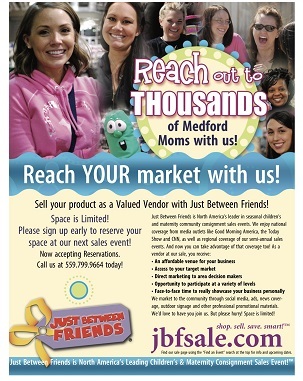 Be sure to visit and "Like" our Facebook page to stay up-to-date on what's happening with JBF Medford. We post giveaways, share information about the sale and even have a special consignor group page! Looking for a fundraiser opporunity? Just Between Friends Medford loves partnering with local schools & organizations and we have several fundraising opportunities available for you. 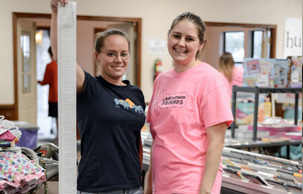 Do you have a local business that you'd like to market to HUNDREDS of families who shop at JBF? We have vendor booths, marketing packages, as well as sponsor opportunies available each season.